Featuring seamless integration with all iPods with a dock connector, iPod Hi-Fi automatically recharges your iPod while docked and displays features of iPod that maximize the iPod Hi-Fi experience such as Tone Control, Large Album Art mode and volume mirroring (Tone Control and Large Album Art features available with iPod nano and fifth generation iPod). iPod Hi-Fi includes a dual-purpose 3.5-mm auxiliary input that accepts either analog or digital signals for easy connection to a wide range of audio sources. iPod Hi-Fi is compact and can be powered by AC or six D-cell batteries, providing more flexibility than any traditional home stereo and is perfect for use not only at home, but just about anywhere you go without compromising sound quality. See the new iPod Hi-Fi here. Please Apple, you know I love you, but this is crazy. I am sure it sounds great, but $350. No way. $199 maybe. $149 is probably about right. No wifi, no deal. maybe they should drop those events… what was the big deal?? I paid $300 for my Bose iPod “boom box” (sounds great BTW), so $350 is not out of line at all, especially if the sound quality is similar or better. Apple’s product also is portable (i.e. uses batteries) and maybe has some other perks? Can’t wait to see what it looks like. Umm… to all of you who are saying that this is the rumored boom box… that is not a boom box. Apple really underwhelmed me this time. Reminds me of the adage, you get what you pay for. 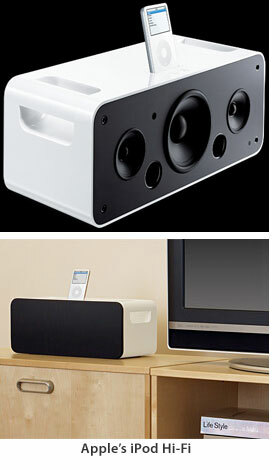 I don’t balk at BOSE’ prices, because I know there is the research is behind the product, same with Apple. If they’re selling sh$* and overcharging for it, they’ll get reamed. SJ/Apple & Co. KNOW that they’re in the limelight, any misstep and the critics are there to roast them in a jiffy. BTW, the Apple Store (usually lightening fast) is JAMMED! !